THE BLUE LAGOON: WORTH IT? To Blue Lagoon or not to Blue Lagoon, that is the question. Should I go? Is the Blue Lagoon just an over-priced, over-hyped tourist trap? I mean, is it even worth it? The Blue Lagoon, named one of National Geographic’s “25 Wonders of the World”, is a man-made lagoon spa fed from water supplied by a nearby geothermal power plant. Let me say without reservation, that the answer to whether it is worth it is an absolute and unequivocal YES. It’s true! You have saved your pennies, requested precious vacation time, and spent the last few months (maybe even years!) dreaming of Iceland and now it is here: you have arrived! After all that planning, you simply cannot depart the island without seeing what The Blue Lagoon is all about! It’s been featured on far too many a travel show and highlighted on far too many an Instagram account for you not find out for yourself what the hype is all about…right? Iceland is a breathtaking country with an endless amount to see and discover. And when paring down your to-do list, some things will have to go, whether it’s because a point of interest is too far a drive or it’s not the best time of year to do a particular hike or activity. Not so with the Blue Lagoon. 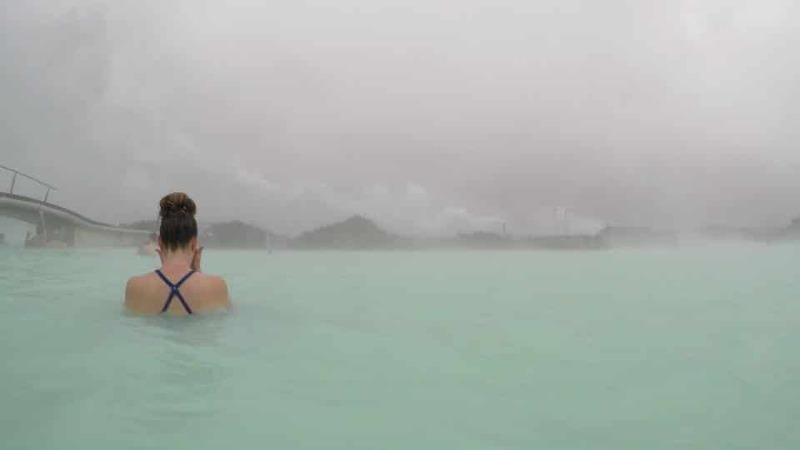 Open rain or shine (let’s be honest: probably rain) and less than an hour’s drive from Keflavik airport, the Blue Lagoon is an easy stop to fit into any itinerary! Come straight off the airplane or leave it for right before you depart. Either way, it’s incredibly doable. There’s just simply no good excuse to keep this puppy off your list! Have any questions about the Blue lagoon? Click here to send us a message and we’ll answer them all! Many recommend a visit to the Blue Lagoon directly after you arrive in Iceland and I wholeheartedly concur! My flight to Iceland was a six-hour overnight flight that had me arriving on a cold slick jetway at the literal crack of dawn. Heading to the Blue Lagoon first thing was a quick way to immediately ease my weary, tired bones and refresh for all the exploring ahead! Nothing like bathing in a geothermal spa to stretch the legs, warm up those stiff joints, and soothe that achy neck that just spent the previous hours firmly planted against the hard, interior wall of an aluminum tube careening at 35,000 feet in the air! …BUT ISN’T THE BLUE LAGOON A TOURIST TRAP? Yes-ish? Places are usually pegged ‘tourist traps’ due, in part, to the sheer popularity of them. But this doesn’t have to be a bad thing. Ask yourself: what makes something popular in the first place? I would answer that popularity is gained when the particular thing in question is super cool. And who wouldn’t want to go to a place so cool it just can’t keep people away? 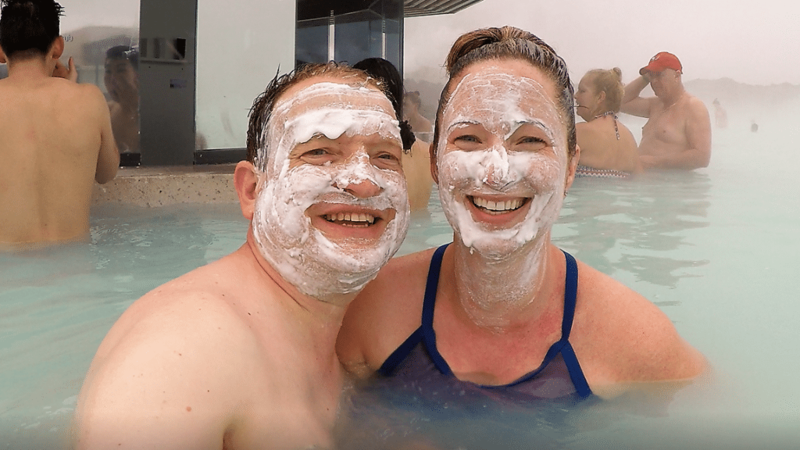 It’s true that there are dozens upon dozens of geothermal pools located throughout Iceland that will cost less and be occupied by fewer tourists. Check those out too! Bathe in all the pools. I’m an equal opportunist! Does this look like a bad time to you? If you visit with an open mind and tempered expectations, you are sure to have an incredible time. Yes, The Blue Lagoon will be busy. Yes, it will cost a small portion of your 401k. But let go of preconceived notions and ‘tourist trap’ stigmas and I promise you’ll be hard-pressed not to enjoy yourself! Book well in advance! As already mentioned, The Blue Lagoon is a popular place, and for good reason! Secure your reservation as early as possible to ensure you are able to go on the day and time that works best for your travel schedule. 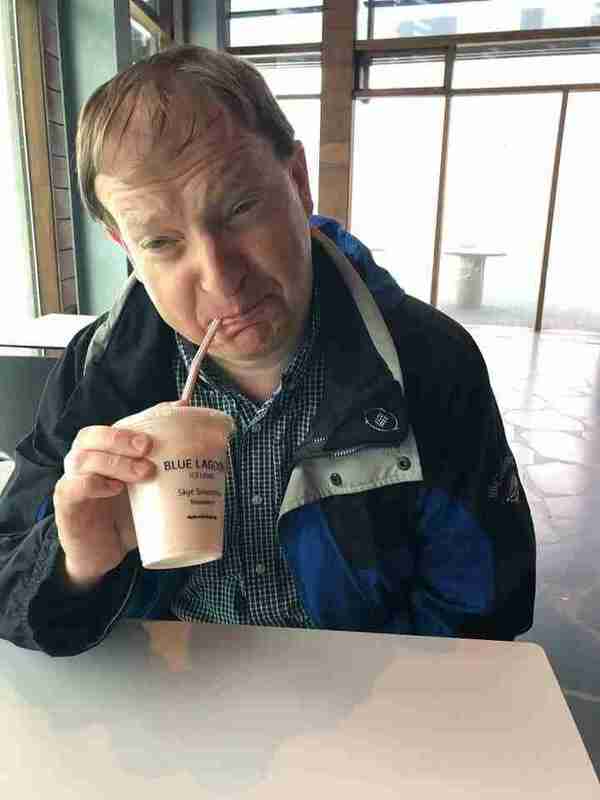 The face of surprise at the sour (though delicious) taste of Icelandic yogurt? Or of regret that we broke into our children’s college fund to buy it? Plan ahead a little, and you can avoid such surprises on your wallet. Wash up! Bathing culture and etiquette is very important in Iceland and a thorough shower is essential. Don’t be shy: get all up in there with that soap, know what I’m sayin’? The locker rooms are well equipped with plenty of showers and towels to go around! If you have long hair, keep it up in a ponytail or bun. And regardless of hair length: condition, condition, condition. Plenty of conditioner is available to guests…use it! It’s your best defense against the silica and sulfur content of the water which in turn will save you from a regrettable, straw-haired fate! In that same vein, I don’t recommend a dunk under the water, conditioner notwithstanding. Sure, it will feel ah-mazing in the moment. But this is not a time to take your chances, unless you’d like to be the one tourist traipsing about Iceland with hair resembling Ben Stiller’s coif in the infamous scene from ‘There’s Something About Mary’. Consider a Go Pro or other waterproof means of taking pictures and videos that you can bring with you into the lagoon. You don’t want to miss the opportunity to bring home evidence like this of you lookin’ a fool on vacation, do you?! Be sure to mosey over to the kiosk containing vats of silica mud where you can help yourself to a mask while you bathe. If arriving right after your flight, pack your airplane carry-on with a clean set of clothes, toiletries, and makeup. You’ll be able to take a shower afterward in the clean and spacious locker rooms and help yourself to provided hair dryers. Before you know it you’ll be feeling brand new and refreshed, ready and eager to conquer the rest of your first day in Iceland! VERDICT: GO FORTH AND BLUE LAGOON! Nothing quite screams “You’re in Iceland!” as definitively as finding yourself in the magical waters of The Blue Lagoon. So please: think no further and just GO. If you’re like me, once you have arrived you won’t be able to stop pinching yourself or wipe the smile off your face. Yes, you’ll think. I am finally here. Considering a visit to the Blue Lagoon? Consider no more! Nordic Green Travel can add a stop at the Blue Lagoon in your custom-made itinerary or make your reservation as included on one of their self-drive tours. Mary Kujawski is an adventurous spirit and travel enthusiast who hails from Minnesota. 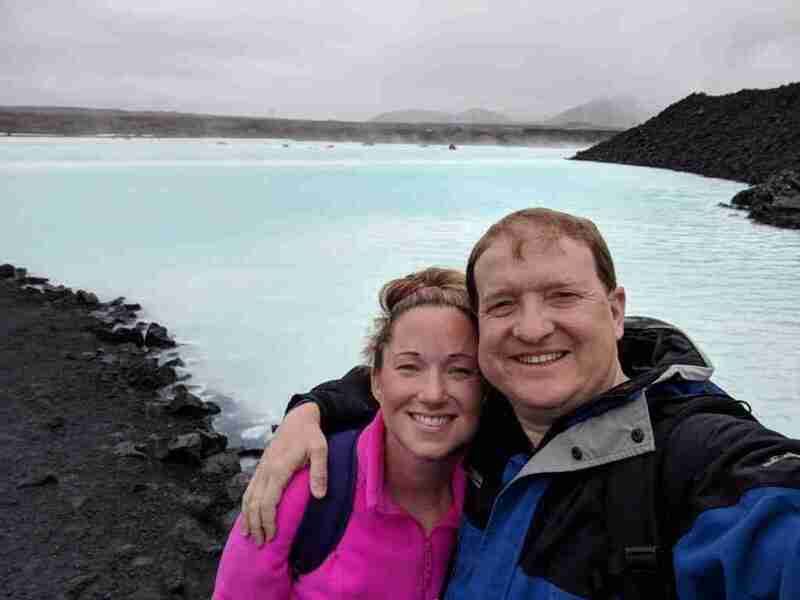 She and her husband visited Iceland for the first time in May 2018 with the help of Nordic Green Travel’s services and, having fallen fast and hard, hasn’t shut up about it since. Seriously. When she’s not running after her three kids or working as Creative Director for Inspirations by Amie Lee, she’s busy plotting her inevitable return to the land of fire and ice. She’s looking forward to sharing her Iceland insights, stories, and suggestions from a tourist’s perspective right here at Nordic Green Travel. Takk fyrir for reading!